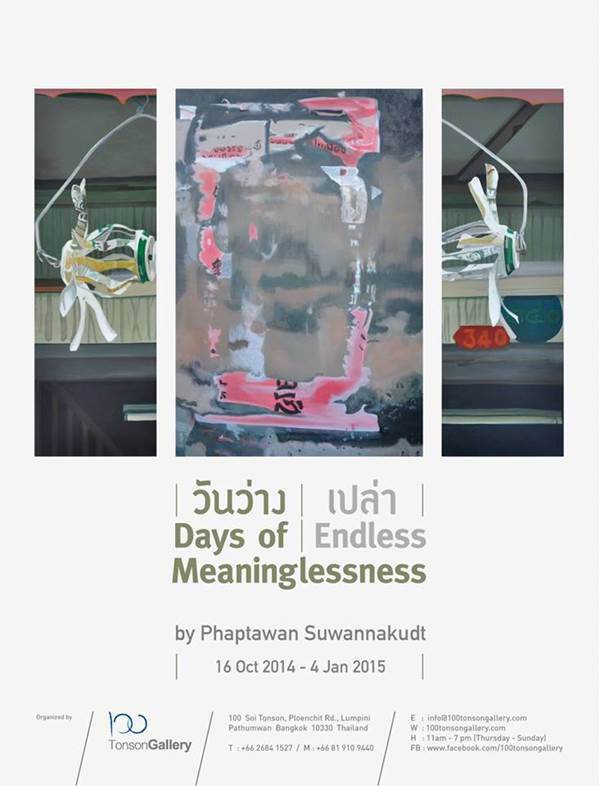 100 Tonson Gallery is pleased to conclude the year 2014 with its final exhibition “Days of (Endless) Meaninglessness” by Sydney-based Thai contemporary artist Phaptawan Suwankudt, whose works has been exhibited across the globe over decades of experience. Trained as a mural painter, Phaptawan presented her contemporary works in exhibition “Locution-Re-Location” here in 100 Tonson Gallery in 2011. Apart from being active in the organization of women’s art in Thailand, Phaptawan was featured in 18th Biennale of Sydney, along with various group exhibitions in New York, Melbourne and many more. “Days of (endless) Meaninglessness” explores the underlying layers of content in a set of photograph she took during her return to her hometown in Bangkok, amidst the country’s political turmoil of late 2013 to early 2014. Selected photographs are cropped and re-created on canvases with a re-imagined color selection. Despite being chronologically ordered to the date the photos were taken, the works are not meant to depict what happened on that day but an imagined emotional resonance. The exhibition consists of 5 sets of acrylic on canvas triptychs.